A timely new survey published by the University of Maryland’s Center for International and Security Studies (CISSM) offers the first insights into Iranian public sentiment following last month’s protests. 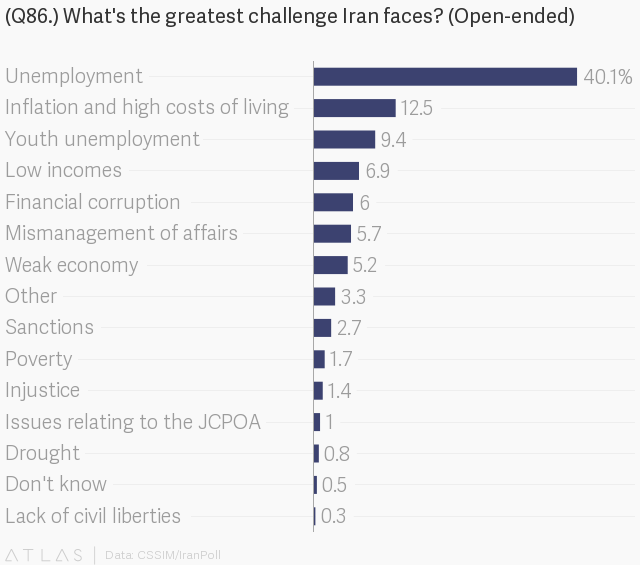 The representative survey, conducted by research firm IranPoll between January 16 and January 24, was derived from telephone interviews of over 1,000 Iranians and covered a broad range of issues. The results underscore the central role that economic frustration played in the recent mobilizations and illuminate a common thread of economic concern around domestic issues, such as corruption and mismanagement, and the perception of foreign interference, particularly around the implementation of the Joint Comprehensive Plan of Action (JCPOA). A clear 58 percent of respondents believe that Iranians economic conditions are worsening, the highest proportion since May 2015. In a refutation of the characterization of the protests as a political uprising, just 15 percent of respondents agreed with the sentiment that “Iran needs to undergo a fundamental political change.” Economic grievances elicited far greater sympathy. Moreover, respondents were generally satisfied with the response of authorities, with 66 percent responding that the police responded well to the unrest. 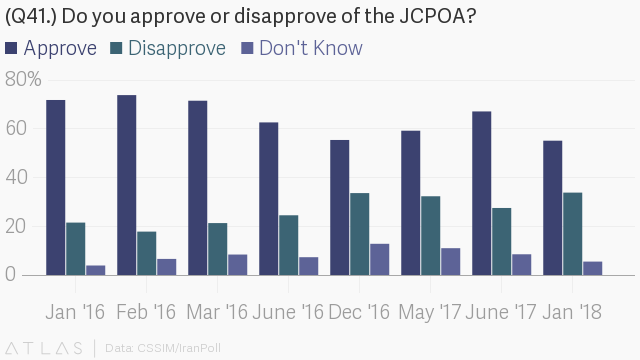 Looking to international affairs, public confidence in the JCPOA has plummeted, and Iranians are beginning to perceive the agreement in more absolutist terms. Iranians continue to blame the lack of economic progress on the hostile posture of the United States. A clear majority of respondents, 73 percent, believe that multinational companies are “moving slower than they could to invest in Iran.” Of these respondents, 82 percent attribute the slowdown to businesses encountering “pressure or fear of the United States,” a proportion that has risen from 75 percent in May of last year. President Trump’s decertification of the Iran nuclear agreement in October of last year has no doubt compounded doubts about American intentions. Just 12 percent of Iranians express confidence that the United States will live up to its obligations under the agreement, down from 24 percent in May of 2017 and 45 percent when the deal was first agreed in September of 2015. 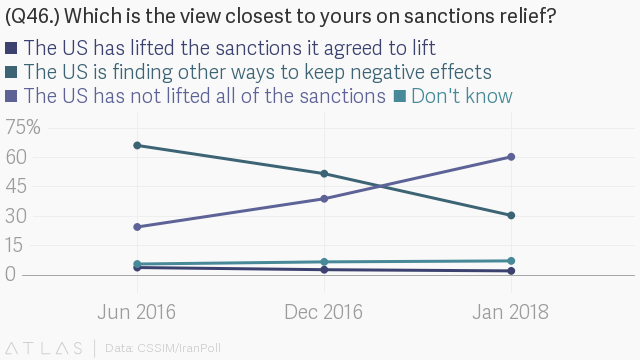 In December of last year the largest proportion of respondents, 51 percent, believed that the United States had “lifted the sanctions it agreed to lift in the JCPOA” but was “finding other ways to keep the negative effects of those sanctions.” In this latest survey, the attitudes have shifted. The majority of respondents, 60 percent, now believe that the United States “has not lifted all of the sanctions it agreed to lift in the JCPOA.” This shift in opinion may reflect Iranian perceptions regarding the postures of the Obama and Trump administrations towards the deal. On a scale out of ten, 69 percent of Iranians rated Trump’s Iran policy at zero, or “completely hostile.” This compares to 50 percent in December 2016, before Trump formally entered office and had the opportunity to put his rhetoric into action. Troublingly, these frustrations are making Iranians more comfortable with possible drastic political responses. When asked what Iran should do in the event the "United States decides to withdraw from the JCPOA agreement and reimpose sanctions on Iran, but other P5+1 countries remain committed to the agreement and do not reimpose sanctions," 52 percent of respondents suggests that the Iran should withdraw from the JCPOA. The inability for policymakers to demonstrate the value of the deal is opening political space and burnishing popular support for those factions in Iran who wish to see its demise. However, Iranians do not intend to lay blame for economic stagnation at the hands of outside forces alone and 87 percent of respondents believe that the Iranian government should take “steps to make Iran’s business environment more appealing to foreign businesses and investors.” Despite strong public support for such reforms, only 58 percent of Iranians report knowledge that the government is taking such steps. Moreover, Iranians consider “domestic economic mismanagement and corruption” as having a greater negative impact on the economy than “foreign sanctions and pressures” with 63 percent of respondents highlighting the former as the primary concern. To this end, Iranians wish their government to prioritize efforts to alleviate poverty, stabilize food prices, and better manage the environment. In addition there is strong agreement that the government should not cut cash or fuel subsidies. A definitive 96 percent of Iranians want the government to do more to fight financial and bureaucratic corruption. Encouragingly, most Iranians remain optimistic about the future. When asked whether today’s children will be financially better or worse off than their parents, 49 percent respond that they will be better off, whereas 43 percent believe they will be worse off. For the Rouhani administration and for Iran’s wider political establishment speak to the urgency of economic reforms. In recent statements, Rouhani has admonished his fellow politicians on the utmost importance of heeding the demands of the people, suggesting that the Islamic Revolution itself resulted from the inability of the Pahlavi monarchy to respond to the popular will. Such surveys offer a clear assessment for the administration of the challenges at hand. The question remains whether Iran’s various political factions can find sufficient common ground to find solutions.